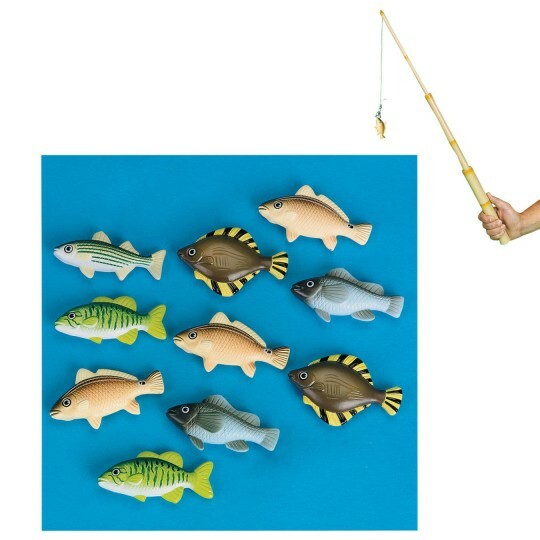 "Lure" Them Into Manipulative Fun! Bamboo-style poles feature magnetic lures. Use to attract any of 10 floating magnetic fish. Includes two poles, each extending to 24"L.
Improve motor control - It's also a fun carnival game! 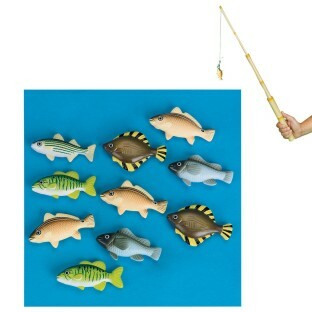 "Lure" them into manipulative fun! Two bamboo-style poles feature super strong magnetic lures that attract any of 12 floating magnetic fish. Fish are approx. 3"L. Poles extend to 27-3/4"L. Help kids and adults practice motor control - It's also a fun carnival game! I purchased this product to use as a simple carnival style game at an under the sea themed event. The concept was good and the fish looked great. The only issue was some of the fish did not seem as magnetized as others. We ended up gluing some additional magnetic strips to the sides of fish so kids could catch them easier. It fixed the issue but diminished the appearance of the fish.